Looking to prepare a meal quickly that still tastes amazing? A pressure cooker might be the perfect addition to your kitchen! Pressure cookers make it easy to put healthy and delicious meals, including soups, roasts, desserts, and more, on your table in no time. What’s even better than just saving time? Pressure cookers use up to 70 percent less energy when cooking compared to traditional pots on your stovetop. Cooking your food faster and with less energy, a pressure cooker can make soup in less than 10 minutes and a pot roast in under an hour! All while reducing your energy use (or heating up your kitchen on a hot July evening). There are health benefits of using a pressure cooker to create savory meals too. Because the lid is sealed and stays closed under pressure, vitamins are sealed in (not boiled away), vegetables keep their vibrant colors, and meat turns out extremely tender. You can even use less seasoning and flavoring since the pot keeps everything together for the shorter cooking time. At Pleasant Hill Grain, we have a great selection of pressure cookers from top brands, including Kuhn Rikon, BRK, and Fissler. Keep reading to learn more about purchasing your next pressure cooker, or browse our selection online. When you first start researching pressure cookers, you’ll notice two main types on the market: aluminum and stainless steel. While each has its benefits, we recommend stainless steel pressure cookers here at Pleasant Hill Grain. Aluminum pressure cookers are lightweight and typically less expensive, but they can stain, pit, and warp easily. Because stainless steel models are nonporous and heavier, they are typically more expensive but will last for years of use with the same consistently reliable results and beautiful finish. They also allow for high cooking temperatures and cooking pressure—letting you create a delicious meal from your stove top. All of the stainless steel pressure cookers we carry at Pleasant Hill Grain have multi-ply bases (the bottom is clad aluminum sealed so the food never touches it). It also allows the heat to spread evenly across the base for uniform heating. Some stainless steel models lack that clad base, so be sure to check specifications before purchasing! Pressure cookers are measured by total liquid capacity. When selecting which size is right for you and your family, keep in mind that larger sized pressure cookers can cook smaller amounts of food (without needing to fill the pot to capacity), but smaller pressure cookers cannot. Since stainless steel pressure cookers last for years, it’s important to pick a model that will meet your needs (and provide mouthwatering meals) for years to come. With many manufacturers, models, and sizes of pressure cookers, there are several factors to consider. Most pressure cooker recipes use a standard 15 psi (pounds per square inch), but the psi of your model (or for the recipe you are making) could be different. Look for models that include an indicator when the desired psi level has been reached—the less guesswork in preparation, the better your meal will taste. You can also look for a quick release option. This allows the cooker to quickly lower the pressure without opening the top and losing heat. Reviewing safety features is also important. Steam valves ensure safety when cooking in the kitchen by safely venting the pressure and heat. Quality, sturdy handles also protect you from the heat of the pot. Also consider the manufacturer’s warranty that comes with your model and brand. Stainless steel pressure cookers are meant to last a while (decades, even), so make sure you don’t have to go through the hassle of replacing multiple parts or the whole piece in a few years. Models with longer warranties, especially stainless steel versions, are typically manufactured to stand up to years of use in your kitchen. Pressure cookers use gaskets that require periodic replacement, so it’s smart to select a manufacturer that’s well established, to ensure future parts availability. 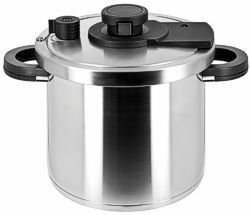 Kuhn Rikon, BRK and Fissler are leading names in the stainless steel pressure cooker market. Each offers high quality pressure cookers that can meet all of your family’s needs and help you make appetizing meals for years to come. Among these makers, Kuhn Rikon offers the widest selection. A Swiss company with products available in more than 40 countries, they also offer a wide variety of highly innovative Kuhn Rikon tools and gadgets. 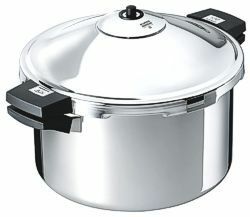 In addition to traditional pressure cookers, we also carry the Kuhn Rikon saucepan braiser and frypan pressure cooker. These have a waffle bottom with dimples that help separate food from fats and enhance food release. The BRK Alpha Pressure Cooker is made in Germany and features a continuously-adjustable pressure regulating valve, allowing you to change the pressure setting at any time during the cooking process. BRK is the only pressure cooking system in the world with a patented lid that can be operated with just one hand. The lid attachment uses no lugs or rotation, so there are no lid-to-pot arrows to line up—just squeeze the top handle, press the lid down, release, and the lid clamps positively in place no matter which way it's turned. This unique BRK design is fast, easy and secure. 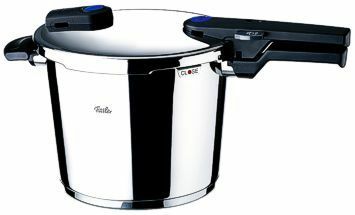 We carry top-of-the-line Fissler pressure cookers as well. The Vitaquick Pressure Cooker saves you up to 70 percent of regular cooking time and up to 50 percent of energy used in conventional cooking. With it, you can achieve a balanced diet and save precious time and energy. The Vitaquick Pressure Set allows you to grill, sear, fry, sauté, steam, and pressure cook all with one pot. The CookStar™ bases found on Fissler products allow you to cook on all types of stoves, including induction, and eliminate hot spots with uniform heat distribution. A handy feature of Fissler’s Vitaquick pressure cookers is their ability to stack with each other for compact storage. Pleasant Hill Grain provides a superior online shopping experience for home, kitchen, and outdoor products, including our selection of stainless steel pressure cookers. We offer free shipping on our pressure cookers and also phone support from our friendly, experienced customer service staff. Have questions? Please call us at the number below—we’d love to help you select a product that’s perfect for your kitchen and your needs!